In our meditations from October 1963 on the necessity of a Secret Identity for the Man of Steel, our flashback has shown us that the proud Kents have encouraged Kal-El to reveal to the world that he's been masquerading as Clark Kent these dozen years or so, on Earth. 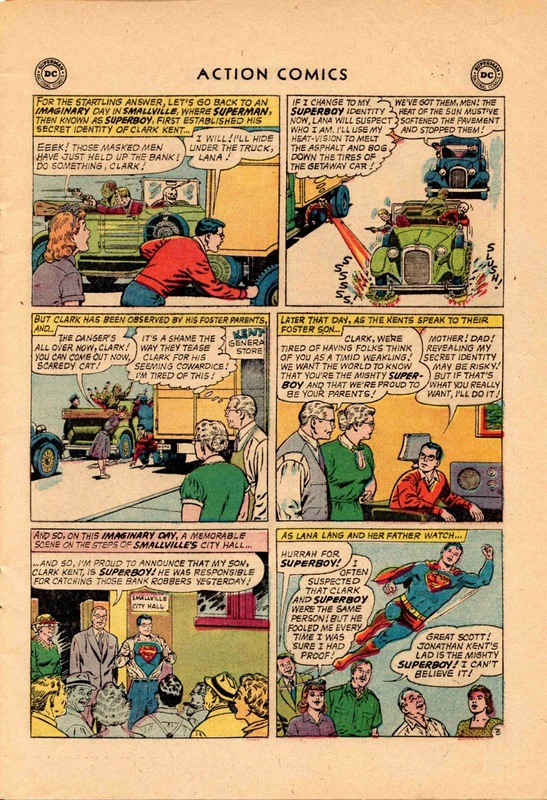 Superboy attends school (what a silly idea, with HIS Super-brain!) and easily gets a pass to perform rescues. 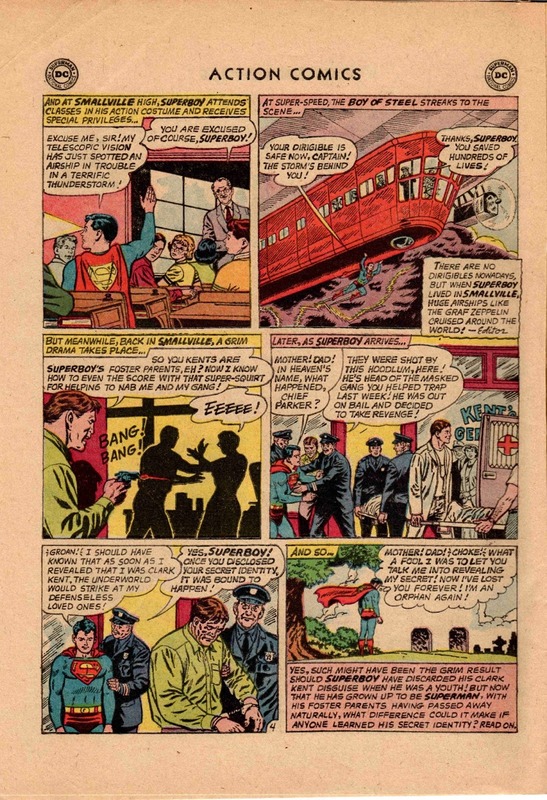 Isn't it a nice touch to orient Superboy in the "old days" by having him rescue a derigible? I don't know about you, but these brief panels depicting Superboy's confusion and loss certainly resonated with my pre-teen self. What would happen if MY PARENTS were suddenly taken from me? Especially if in some ways IT WAS MY FAULT -- I was the one who put them into danger? The last panel on the page, showing Superboy mourning the loss of his parents' lives at their graves, is a sombre one for me. Lots of publicity ... the inane kind that gets in his way. Superman is constantly under public scrutiny by his adoring public. People knock on his door day and night. Rescuing parakeets, for gosh' sakes! That's no way for a BNS (Big Name Superhero) to live! 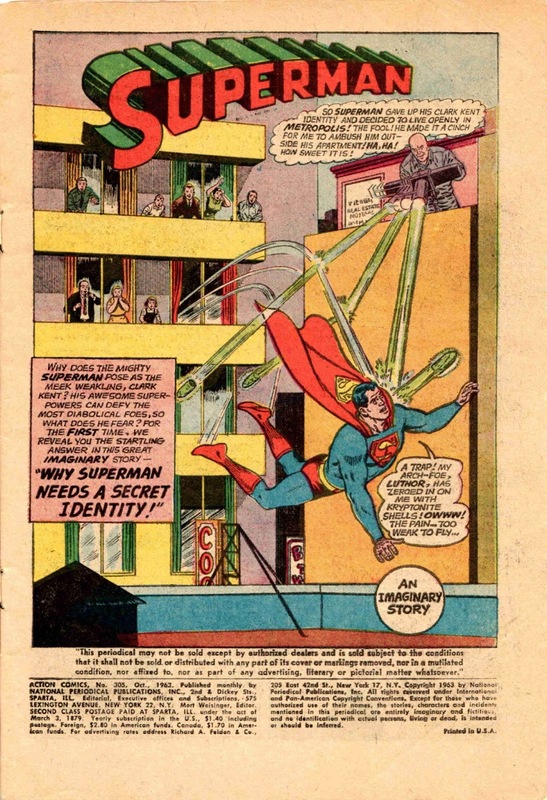 On the other hand, don't you imagine that the property values in the neighborhood of the Superman Arms probably took off like a bird or a plane? On Monday we'll continue this page-by-page comic-book survey, and follow this alternate-time thought experiment. "Why Superman Needs a Secret Identity! 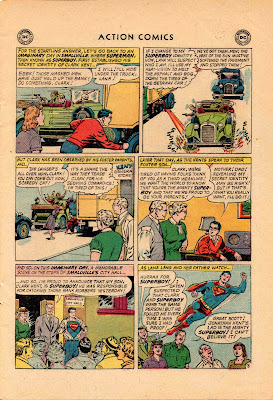 ", from Action Comics #305 (October 1963), was written by Leo Dorfman. Pencils by Curt Swan, inks by George Klein. This story is full of sobering twists, but begins with a bellylaugh. Perry White's got the measles, and he's confined to a hospital for a few days! Clark and Jimmy are on their way to get some work instructions, when they take a wrong turn on the way to Perry's room in the Isolation Ward and interrupt a weird kind of robbery. Benny wants the valuable radium in the hospital's safe (used for radiation therapy). He starts his countdown, and Clark has one minute to either abandon his Secret Identity and dash in as Superman to rescue the others, or .... be vewwy, vewwy snee-ee-eaky, as Elmer Fudd might say. The last panel of the page is a great one, as it visually illustrates the great "split" between the mild-mannered reporter and the mighty Superman. 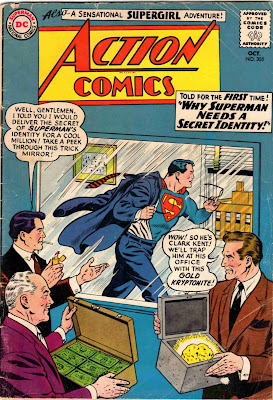 Let's use a branching form of Alternate History to explore what might happen if, through various scenarios, Clark Kent is known to be the Guy from Krypton. 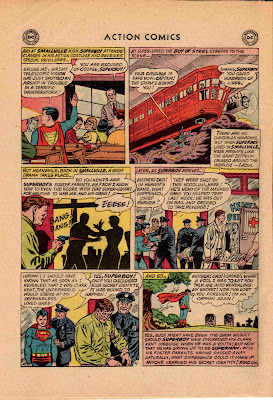 In the first page of our opening salvo, Superboy thwarts a bank robbery inventively, inspiring Martha and Jonathan Kent to proudly tell the world that their son is Superboy. Aren't these brief snippets of human interaction great? Lana teasing "fraidy-cat" Clark, the Kents telling their son how proud they are of him, and so on. Stay tuned for Friday's continuation of this great story. 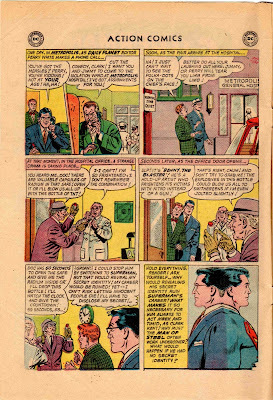 Would everything have come up roses if a Strange Twist of Fate (TM) had revealed Clark Kent as Superboy in Smallville? This wonderful comic book is cover-dated October, 1963. As we pass through its pages we'll be having an everyday experience. 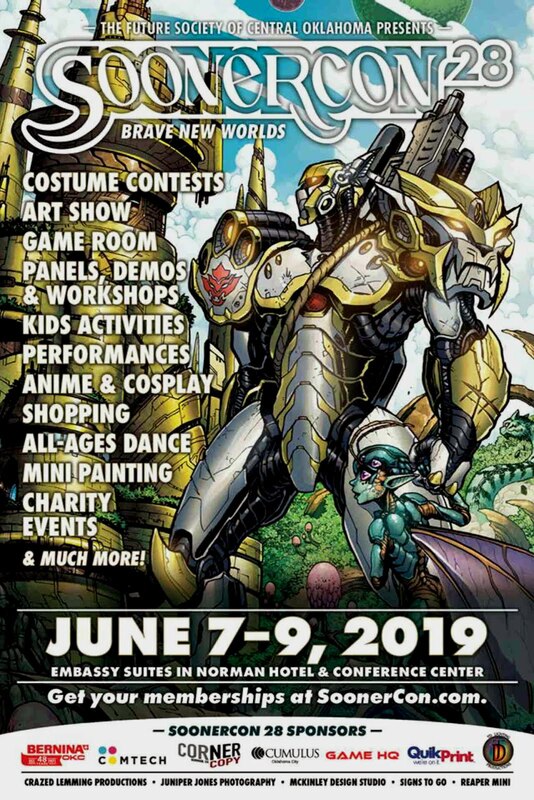 Comic books had an average paid circulation of over 240,000 issues, and kids were learning through the world around them about right and wrong, good guys and bad guys. What greater good guy could there be, than Superman? 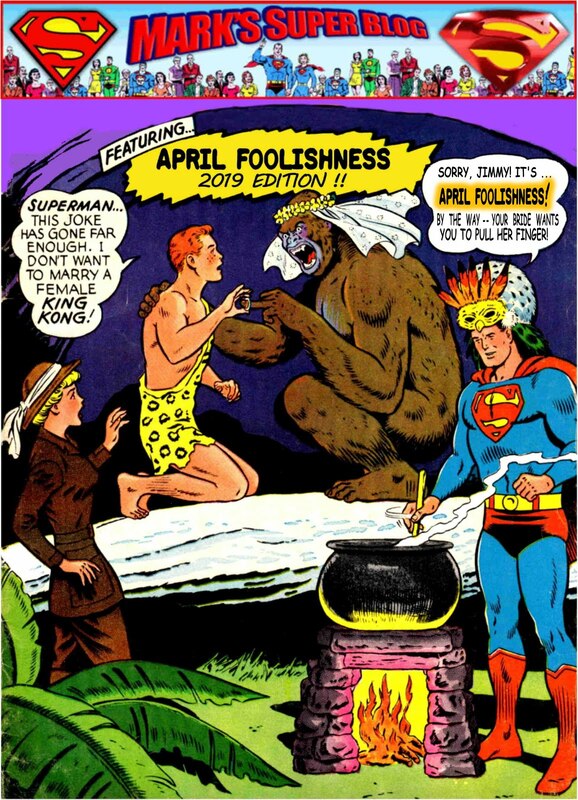 Another great, evocative piece of cover art by the great Curt Swan. You can tell that the three guys in the foreground are crooks. Number One is using a decadent SOLID GOLD ZIPPO to light up. Guy Number Two is waving around a valise full of greenbacks. 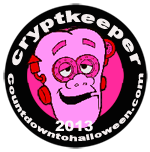 And Number Three is waving around Gold Kryptonite, one of those harmful isotopes from Superman's home planet. This stuff can remove a Kryptonian's powers permanently, leaving them subject to revenge attacks from the scores of evildoers they've jailed. Just now, while bloviating, I noticed an anomaly on this cover. WHERE IS THE PRICE? There should be "12¢" somewhere across the top of the page. I guess we'll read the story and see! 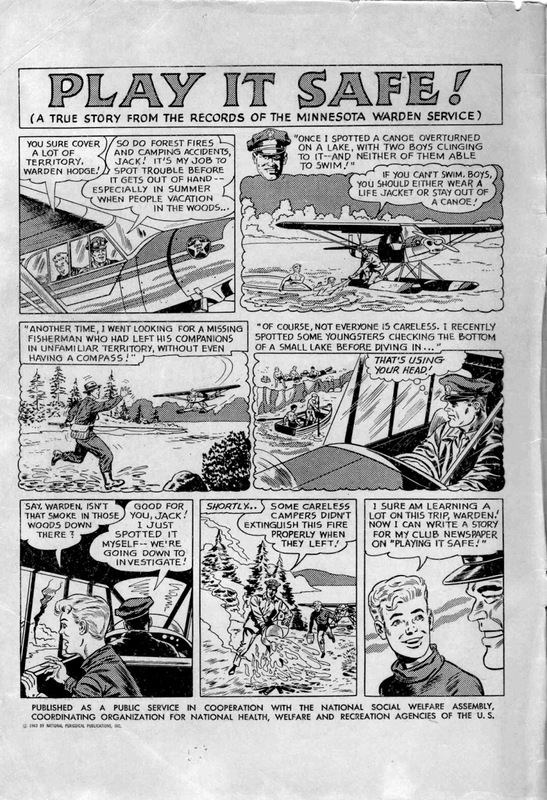 This public service announcement covers some topics of outdoor life that should be common sense, but often forgotten, such as the fisherman in the middle row, who took off without any way to find the path back to his campsite. You laugh at semi-literal babes-in-the-woods behavior like this. You tell yourself YOU would have more common sense than this ... until you go outside in the morning to your car ... only it's been stoel out of your driveway, because you LIKE A MORON left it runnig with the key in it, to warm up. 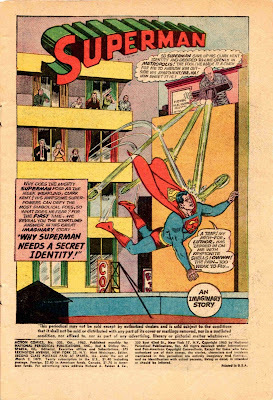 Our splash page heralds the arrival of another great story by Leo Dorfman, visualized by penciler Curt Swan and (possibly) inker George Klein. 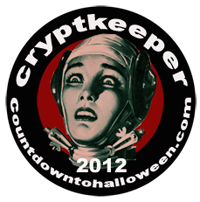 The terraces of frightened onlookers were appropriated for my portmanteau art for October 2015's Blog-o-Ween. 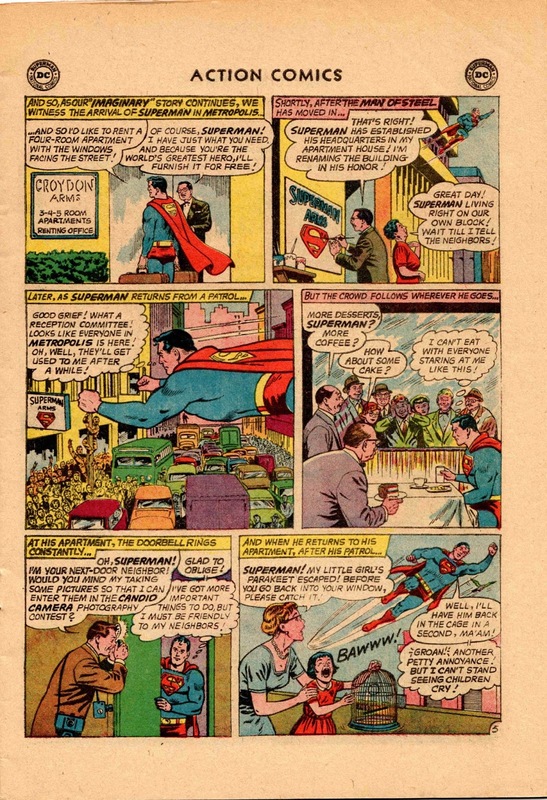 Lex Luthor, while hating Superman, is also an astute student of pop culture, given that he quotes Jackie Gleason's signature line, "How Sweet It Is!" which Gleason first introduced earlier this same year in the film Papa's Delicate Condition. Join us Wednesday for a few pages that begin this story, as we travel page-by-page through a wonderful bit of American life from the bright side of the 1960s.